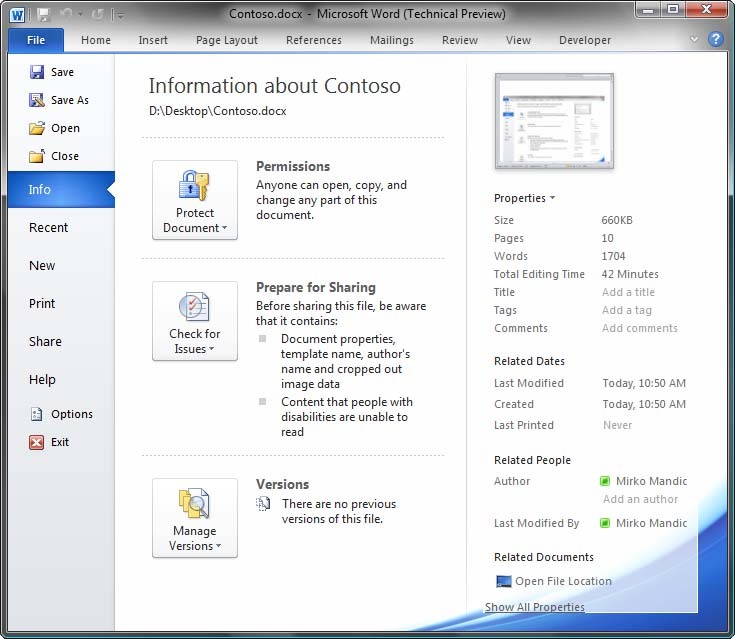 In the 2007 release of the Microsoft Office system, file-level functionality was accessible on the Office menu that was available by clicking the Office button. The Backstage UI exists in almost all Microsoft Office 2010 applications that support the Office Fluent UI: Microsoft Access 2010, Microsoft Excel 2010, Microsoft OneNote 2010, Microsoft PowerPoint 2010, Microsoft Project 2010, Microsoft Publisher 2010, Microsoft Visio 2010, and Microsoft Word 2010. The following sections describe the structure of the new UI, and examine details you need to implement your own custom Backstage UI. Backstage view A full-screen user interface model that exposes file-level functionality for the active document. It is part of the Microsoft Office Fluent user interface, which replaces the previous system of layered menus, toolbars, and task panes. Definitive command A command that take you from the Backstage view back to the document. Definitive commands close the Backstage view when they are invoked. Some examples of such commands are Save, Save As and Print. Fast Command A command that exist on the left-hand navigation bar, providing quick access to common functionality. Some examples of such commands are Save, Save As, and Close. Tab A page within the Backstage view that is scoped to a particular task. The Backstage view consists of a set of top-level tabs. The first (top-most) tab is the default. If no location is specified, custom tabs are added at the very bottom of the navigation bar, below all of the existing tabs and fast commands. There is an upper bound of 255 tabs allowed in the Backstage view. Group UI container used to organize related functionality inside of Backstage tabs by groups. In this section, you examine the components of the Backstage view. Looking at Figure 1, one of the first things you notice after launching an Office 2010 application is the new File tab which replaces the Office button. Clicking the File tab displays the Backstage view. You can also open the Backstage view by pressing the Alt + F keys. On the left-side of the Backstage is the navigation bar with fast commands (such as Save and Open) and tabs (such as Info and Recent), as shown in Figure 2. Fast commands provide access to frequently used tasks that are not explicitly associated with tabs. A tab groups together functionality related to a common task and distributes it across one or two columns in a set of groups (like Compatibility Mode and Permissions). The solution provider may wish to create an entirely new tab to display a large quantity of information related to the active file. The solution provider may wish to add a group to an existing tab (especially the Info tab) so that the information is highly visible. The solution provider may wish to create a new tab focused around this custom functionality (e.g. junk mail management). The solution provider may wish to add custom functionality to an existing tab because that tab is a logical home for the new feature, or use it as a fast command because the functionality in question will be used frequently and can be represented with a single button. Developers familiar with Ribbon UI extensibility should feel comfortable with Backstage view extensibility as it uses essentially the same files and structures. Components are added to the Backstage view by using XML and functionality is associated with those components by using callback procedures. For more information about Ribbon extensibility, see the three part series of articles titled Customizing the 2007 Office Fluent Ribbon for Developers. Just as with the Ribbon UI, the structure and components of the Backstage view are defined by using XML markup. The following example shows the general format of an XML markup file that customizes the Backstage view in Word 2010. The following sections describe this markup in more detail. This markup results in the customized Backstage view shown in Figure 3. The <backstage> element delimits the custom structures of the Backstage UI. Hierarchically, the <backstage> element is one of the four allowed top-level elements inside of the <customUI> element. The other allowed elements at same level are <ribbon>, <contextMenus> and <commands>. insertAfterMso The identifier of the built-in tab after which the custom tab should be inserted. In this example, custom tab is added after the Info tab. label The text that appears on the tab; in this example, the tab’s label is Sample Scenarios. columnWidthPercent Specifies the width of the first column in the tabbed area, as a percentage. The width of the two columns is a total of 100% so if the first column is set at 30%, the second column is 70% of the total width. The tab is labeled and it is placed after the built-in Info tab. All attributes in Microsoft Office Fluent UI XML customization markup use the camel-casing convention, which capitalizes the first character of each word except the first word—examples include onAction and insertBeforeMso. Each <tab> element can have one or two columns; in this case, the custom Sample Scenarios tab contains two columns. Further, each column can host multiple <group> elements; in this example, there are two groups in the first column (they are labeled Group One and Group Two) and a single group (Group Three) in the second column. The <group> element also allows several attributes such as id, label, visible, enabled, and helperText, to name just a few. You can find a listing of control elements and associated attributes, element children, and other information later in this article. Conceptually, custom Backstage groups are similar to Ribbon groups, with two notable differences. First, unlike a Ribbon group, a Backstage group is not required to position its content into exactly (up to) three rows; in this example, there are several various <layoutContainer> elements providing the structure and rich layout capabilities, but without the three-row restriction. This element contains a layoutChildren attribute that allows you to specify whether the child objects it contains are oriented horizontally or vertically. Second, unlike a Ribbon group, a Backstage group can include an optional <primaryItem> element, which can either be a <button> or a <menu>. The <primaryItem> provides the central point of focus for a group which can be a button (like the primary button inside of Group One) or menu (like the dropdown menu inside of Group Two). Looking at the <button> element in the sample, one of the attributes it contains is isDefinitive. When this attribute is set to true, clicking the button triggers its callback and then closes the Backstage view, returning you back to the document.Looking through the remainder of the XML, there are several components defined along with various attributes. The resulting custom tab looks similar to Figure 3. Looking back at the sample, when you click the button, the callback subroutine pointed to in the onAction attribute is triggered. The following example shows a simple callback that might be triggered from the button. MsgBox "You clicked the " & control.Id & " button. " In this instance, when the procedure is called, Microsoft Office passes in an IRibbonControl object that represents the calling control. Properties of the IRibbonControl object include the Id and Tag properties. As illustrated in the code, the Id property lets you call the same procedure from different controls. All callback procedures take the IRibbonControl object and may also include other properties such as the pressed status of a toggle button. The next few sections demonstrate the steps to customize the Backstage view at the document-level by modifying an Open XML Format file and at the application-level by using a COM add-in created in managed code in Microsoft Visual Studio. For the procedure customizing the Backstage view at the document-level, you can use the XML described in the previous section. The COM add-in uses different XML to modify the Backstage view. At the document level, the process for customizing the Microsoft Office Fluent UI by using XML markup involves the following steps. You can follow these steps by using the XML markup described in the previous section. Although you should know what is going on within the Office Open XML File structure, you may be able to bypass these steps. You can take advantage of the Office 2007 Custom UI Editor. This tool enables you to open a document, insert custom UI (with a part targeted to Office 2007 or Office 2010), and then save the document together with the XML markup. It performs the steps listed in this example for you. It also enables you to add custom icons to the customUI folder, and makes it easy to refer to these icons. Create the customization file in any text editor by writing XML markup that adds new components to the Microsoft Office Fluent UI, modifies existing components, or hides components. Use the XML markup from the example seen earlier in this article. Save the file as customUI14.xml in the folder that you created. Validate the XML markup against the custom Microsoft Office Fluent UI schema (optional). Create a document in Microsoft Word 2010 and then save it as an Open XML macro-enabled file that has the .docm extension. You must save the document in a macro-enabled format if you want to add code that reacts when the user interacts with the Microsoft Office Fluent UI customization. You should also make sure that macros are enabled for the document. You can do that by clicking the File tab, and then clicking the Trust Center tab. Click the Trust Center Settings button, and then select Enable all macros. Add the customization file to the container by dragging the customUI folder from the desktop to the zip folder. Drag the _rels folder from the .zip folder to the desktop. A folder named _rels that contains the .rels file appears on the desktop. Between the final <Relationship> element and the closing <Relationships> element, add the code that creates a relationship between the document file and the customization file as shown in the following example. Ensure that you specify the folder and file names correctly (the Id attribute supplies a unique relationship ID for the customUI file—its value is arbitrary as long as it is unique). Save the .rels file and then drag it to the _rels folder in the compressed file, replacing the existing .rels file. Remove the .zip extension and then open the document. If you do not see the Developer tab, you must set this option. To do this in your application, click the Microsoft Office button, click Options, click Ribbon, and then in the Arrange Commands on Tab box, select the Developer option. This is a global setting that identifies you as a developer in all Office applications that implement the Microsoft Office Fluent UI. In the Visual Basic Editor, double-click ThisDocument to open the code window. Type the VBA function as shown in the following example. Save the document and then close the Visual Basic Editor. Click the Microsoft Office button and then click the Sample Scenarios tab. Click the button marked Primary Button. Figure 4 shows the dialog box. You can also use COM add-ins to change the Microsoft Office Fluent UI. When you decide to create a COM add-in that incorporates UI customization and uses managed code, you have two choices. You can create a standard COM add-in by using the Shared Add-In template that is included with Microsoft Visual Studio 2010. Or, if you have installed Microsoft Visual Studio 2010 Tools for Office, you can create a COM add-in that has several advantages over the standard shared add-in. Among other advantages, add-ins that you create by using Microsoft Visual Studio 2010 Tools for Office run in separate application domains, and the programming model for these add-ins is simpler, and more maintainable than that used by the shared add-in template. However in the following steps, you create a managed Microsoft Word COM add-in by using a standard share add-in. For more information about how to create a custom Microsoft Office Fluent UI by using a shared COM add-in and by using Microsoft Visual Studio Tools for Office, see the article titled Customizing the 2007 Office Fluent Ribbon for Developers (Part 1 of 3). Start Microsoft Visual Studio 2008. In the Name box, type BackStageCOMAddin, and then click OK to create the project. On the Enter a Name and Description page, type BackStageCOMAddin for the name and Update the Word Backstage View for the description, and then click Next. To interact with Word 2010 and the Microsoft Office Fluent UI object model, you must have references to type libraries as follows. In Solution Explorer, expand the References folder. If you do not see the References folder, on the Project menu, click Show All Files. Click the COM tab, select Microsoft Office 14.0 Object Library, and then click OK.
At the top of the code screen, add the statements as show in the following examples. In the Add New Item dialog box, select XML File. Name the new file customUI14.xml, and then click Add. In the new XML file, add XML markup as shown in the following example. In Solution Explorer, select customUI14.xml. On the Project menu, click BackStageCOMAddin Properties. From Solution Explorer, drag customUI14.xml onto the Resources design surface. This action creates a new file-based resource that contains the XML content. From now on, the customUI.xml file is automatically stored as an application resource, and you can retrieve this content by using Visual Basic or Visual C# language features. Close the Resources window. When prompted, click Yes to save the resources dialog. Find the existing declaration for the applicationObject variable, and change it so that it refers to a Word.Application object. That is, change the declaration so that it looks as shown in the following examples. Change the existing line in the OnConnection method, which creates an instance of the Word.Application object. (Visual Basic only) Change the line of code, near the top of the class, that begins with Implements, adding support for implementing the IRibbonExtensibility namespace as shown in the following example, and then press Enter. Visual Basic inserts the GetCustomUI procedure automatically. (C# only) At the end of the public class Connect : statement, add a comma and then type the interface name as shown in the following example. (C# only) Right-click the interface that you added, click Implement Interface, and then click Implement Interface Explicitly. This adds a stub procedure for the only IRibbonExtensibility interface member: GetCustomUI. Change the GetCustomUI method so that it looks like the following example. GetCustomUI is implemented to return the XML string for your user interface customization, and should not be used for initialization. In particular, you should not attempt to display any dialog boxes or message windows in your GetCustomUI implementation. The more appropriate place to do initialization is in the OnConnection method (for shared add-ins) or in the ThisAddIn_Startup method (for add-ins created by using Microsoft Visual Studio Tools for Office). Add the following method to the class. This method is called when the Ribbon UI is loaded and creates a variable referencing the Ribbon UI and then repaints the Ribbon. The following are frequently asked questions that relate to the Backstage View. What is the maximum number of custom tabs I can add to the Backstage View? The upper bound for the number of tabs is 255. Can I specify where to add a tab? You can specify whether a custom tab is displayed before or after an existing tab. Can I reorder existing tabs? You cannot re-order existing tabs. You may only specify the relative order of tabs by inserting a tab before or after another tab. Can I modify the column layout of existing tabs? You cannot change the column layouts of any existing tab that you did not create. You can add a new group to any column of an existing tab. You can also specify whether the new group is displayed before or after an existing group. One restriction is that you cannot add more groups to tabs which contain a taskFormGroup such as the Share tab. Can I reorder existing groups? You cannot reorder existing groups. You can only specify relative orders for new groups that you create. When I add multiple COM add-ins that modify the Backstage to an Microsoft Office application, how do I know the order in which they are implemented? The order of precedence between competing modifications is the last one loaded wins. Can I repurpose one of the existing definitive command buttons, fast command buttons, or tabs by changing its onAction callback attribute? For example can I change the file Save button so that is has an additional type, or displays only one file type? It is not possible to override these commands from the custom UI XML markup or by using the object model. Using the DocumentBeforeSave event is one alternative, but using that doesn't really change the functionality of the individual commands that show up in the Change File Type gallery in the Backstage. A better solution would be to consider hiding the built-in UI and rebuilding it fully with custom commands. The following XML reference contains details about the controls that are included as part of the Backstage view. A delimiter for a lower set of groups. Specifies attribute overrides for all controls with the specified idMso value. Specifies a collection of Command elements. Control elements can enable, disable, or clone existing controls. Creating a new (custom) controls with the Control element is not possible because the Control type cannot be specified. Container for a set of contextMenu controls. The root tag of all Fluent UI customizations. The left column of groups. Represents the item in a dropDown or comboBox control. Represents the button in a radioGroup control. Represents the container for the radioButton control. The right column of groups. Represents the primary container for related Backstage view controls. A delimiter for an upper set of groups. Backstage view extensibility provides a powerful opportunity for you to provide users with a customized, targeted set of menus and options. Best of all, you can use the experience and structures you used when customizing the Ribbon UI. I encourage you to explore the various components that comprise the Microsoft Office Fluent UI to create customized applications for your organization. Acknowledgment: Thank you to my editor, Linda Cannon, for her help in preparing this article for publication.